What do we want out of Twitter? Can the Mr. Tweet help non-profits Twitter better? In addition, Mr. Tweet also recommends people that I should follow based upon who I am already following. Recommendations include the “Twitteristics” of each person, and a list of who I also follow that follows the recommended person. It made me think a bit about what the non-profits I work with want out of Twitter. It’s engagement. The National Wildlife Federation’s Danielle Brigida recently elaborated on its Twitter strategy and successes here. It is a fascinating, well-thought out interview with Social Ch@nge. The NWF uses Twitter to listen to conversations, repair reputation issues, publicize articles and events, nudge people towards their social media hubpage, and increased online activism. 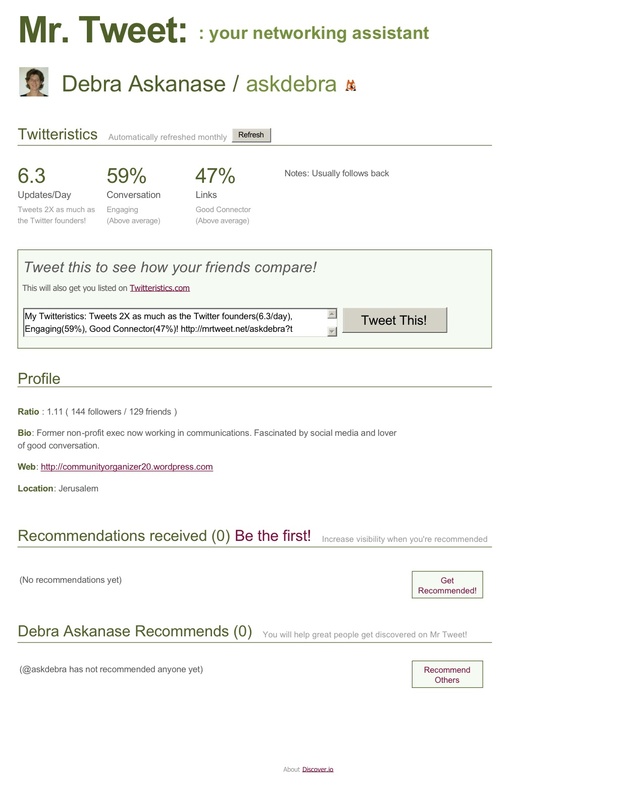 That’s quite impressive, and shows the potential of Twitter for non-profits. How can Mr. Tweet help your non-profit? Mr. Tweet can help non-profits find people to follow who might become collaborators, who are colleagues, or possibly donors/investors. Mr. Tweet can help you find key influencers as well. What Mr. Tweet does best is recommend people based upon who you follow — its algorithms are set to analyze the types of people on Twitter that you already follow. If you mostly follow social media thought leaders, then Mr. Tweet will recommend more of the same. Likewise, if you mostly follow people in your industry. If you want to publicize your organization and bring in new stakeholders, Mr. Tweet’s suggested “influencers relevant to you” could re-tweet, make introductions for you or provide relevant connections. However, If you are looking for non-profits Twitterers, in general, then you might want to check out Chris Brogan’s creation, Twitter Packs to find others with your specific industry interests or in your specific location. The non-profit Twitter Pack list is here. Or, quite simply, look at the people you consider important colleagues/stakeholders/collaborators and with whom they converse regularly. Mr. Tweet is a fine robot assistant, but not perfect. If you use it after you’ve been on Twitter a while, then the application will have more information to draw upon. However, it can’t do it all. It can’t find those quality influencers and connectors that everyone you know mentions, but Mr. Tweet may not know. It can’t recommend people outside of your areas of interest, and it doesn’t make introductions. What would I love Mr. Tweet to do? Add a section showing the websites people in my network most often recommend or link. Show me conversation circles: what are conversational clusters and who usually participates? Lastly, who (not in my network) most often tweets about others in my network? This information would be valuable to me for finding new connections, new websites and information about my industry, and enhancing my ability to participate in relevant industry conversation. You have to do all that work yourself. What Mr. Tweet is, is your general research assistant. And that’s a good beginning. I look forward to hearing if non-profits are finding Mr. Tweet useful, and other suggestions for finding non-profit Twitterers. And…I look forward to making connections!